(6:30 p.m. EDT) -- Rarely are "river cruising" and "family" spoken in the same sentence. In fact, kids onboard river cruise boats are an industry rarity. 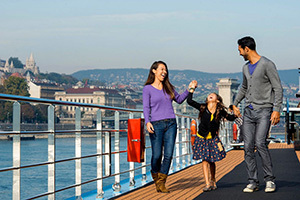 Only a handful of lines, such as Tauck and Uniworld, have family-friendly sailings, and those are only offered occasionally. Adventures by Disney and AmaWaterways are about to change that in a big way. The companies have teamed to offer five weeklong Danube River cruises -- including one during the Christmas market season -- aimed squarely at families, starting in summer 2016. Adventures by Disney, a 10-year-old company that offers immersive adventures for families in 30 destinations on six continents, has put together itineraries with family activities both on and off the ship, while Ama is building a ship (AmaViola) designed specifically for families, complete with connecting cabins, which are unique in the world of river cruising. Both companies hope the result will be fun and active-adventure cruises that appeal to multigenerational families looking to learn about new places together. Ken Potrock, senior vice president and general manager for Adventures by Disney, said the fit with AmaWaterways was a "perfect match" because the river cruise line already offers a high-quality product, and the companies' philosophies aligned. "We are so very excited to bring the beauty of river cruising to the family market through these special sailings with Adventures by Disney," said Kristin Karst, co-owner and executive vice president of AmaWaterways. "River cruising presents a terrific opportunity for immersion into the sights, history and culture of the world's most magical destinations. We look forward to working together with Adventures by Disney to offer innovative experiences that help families create unforgettable memories." The partnership isn't necessarily what you think when you think "Disney." You won't see characters on the boat or in ports. Instead, Disney-trained "Adventure Guides," will introduce passengers to locals and local experiences. Because the target market is primarily U.S. passengers and English-speakers from around the world, about 50 percent of the guides are from the U.S.; the other half are locals from the destinations the cruise visits. All guides speak English. In 2016, passengers can sail seven-day itineraries July 7, July 14, July 21 or July 28, beginning in Vilshofen, Germany, and finishing in Budapest, Hungary, or vice-versa, depending on the cruise. Passengers will see eight cities in four countries, with the option of adding on a two-night pre- or post-cruise stay in Prague, Czech Republic. A fifth cruise, from Budapest to Vilshofen, will start December 22 and explore the Christmas markets, festive open-air vendor spaces with music, drinks, food and locally made crafts found throughout Europe during the Christmas season. Watching the Vienna Boys Choir perform on Christmas at Hofburg Palace Chapel while you enjoy a holiday lunch. The idea is that families can travel together and join in activities together -- or they can do things on their own, with kids hanging out with new friends, watching Disney movies, making strudel or playing destination bingo, while parents enjoy adult time, perhaps sampling beer or wine or exploring the nightlife in a port. "Parents want to see the world through the eyes of their kids," Karst said. Meals will continue to emphasize local cuisine, but Ama has added a kids menu as well, and while staples like pizza and chicken fingers will be available, the menu was designed to offer children sophisticated options, Karst said. Vegetarian options will be available, as will alternatives for those with allergies and sensitivities. The sailings are all inclusive and hassle free, Potrock said, so families have more leisure time. Passengers can pick from two or three excursions in each port, but they don't have to decide until they're onboard, which provides flexibility in case kids (or adults) make friends onboard and want to spend time with them in port. The minimum age for sailing is 4, but the recommended age is 8 and older. While, so far, the partnership between Adventures by Disney and AmaWaterways is only nailed down for 2016, both companies expressed hope for an extended venture. Prices start at $4,100 per person for adults, $3,900 per person for children. Past Adventures by Disney travelers (called "Adventure Insiders") can start booking at 8 a.m. April 14. Cruises will be available for booking for everyone else starting April 15. Passengers can book by calling 1-800-543-0865 or contacting a travel agent.